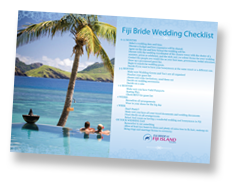 Getting married in Fiji? Wedding and honeymoon ideas. The Fiji Islands are a vibrant palette of azure waters, white sand beaches and lush, tropical landscapes making it a jaw dropping backdrop for a stunning wedding and honeymoon that oozes romance and beauty. Over the past 40 years our specialist Fiji wedding planners have worked with hundreds of couples planning everything from intimate elopement ceremonies to enormous weddings with hundreds of guests. Common questions we’re asked by brides (and a few grooms) are “We want a unique Fiji wedding. What would you suggest?” and “What’s something different we can do on our Fiji honeymoon?“. In response to this we’ve put together our top 5 unique Fiji wedding and honeymoon ideas. Be sure to check back regularly as we plan to add to this list from time to time. Imagine escaping to your own private tropical island resort where the only guests are your friends and family and the role of the resort staff is to cater to your every whim! Formerly thought to be the domain of the super rich, the potential to hold your wedding on your very own slice of Fijian paradise may be within reach. Wake up to the sounds of the lapping ocean mere metres from your bed or stay in a tree house hidden among the palms where there’s nothing between you and the cool ocean breeze but a sheer mosquito net. Relax to the silence and serenity of island life as you shake off the stresses of twenty first century living but with all the five star mod-cons you’re accustomed. Contact us for a more information about Fiji private islands for hire and exclusive use resort options. The 180th Meridian is the line that divides the earth into the Western and Eastern Hemispheres and is the basis for the International Date Line. Fiji, along with Russia and Antarctica, are the only land masses through which the Meridian crosses. What makes the 180th Meridian popular with couples and honeymooners is that by locking lips and taking a simple sidestep from one side of the Meridian to the other means you’re, in effect, kissing for two days. While the 180th Meridian travels through several parts of Fiji, most are uninhabited and inaccessible. It does however cross through Taveuni Island which is easily accessible by boat from Viti Levu and resorts on neighbouring islands. Imagine exchanging vows on a beach where your footprints may be the only ones seen for months – even years. Whether your preferred mode of transport is boat, helicopter or seaplane, we can organise a wedding ceremony in Fiji’s most spectacular locations. Your wedding photos will be testament to an unparalleled experience that few can replicate. Charter parts of the Fijian archipelago not seen by many as you sail into married life aboard a cruise liner, sailing boat, catamaran or luxury motoryacht. Sail across turquoise waters to unspoilt beaches where the cool shade of swaying palms fan beautiful white sand – the perfect backdrop to say your “I Dos”. The beauty of Fiji lies in her diversity and, with over 330 islands to explore, traversing her waters by boats provides an unforgettable experience for all on board. Swim in crystal clear water over coral reefs teaming with marine life. Meet locals in traditional villages where you’ll be welcomed like one of the family. Discover world heritage listed towns and marvel at the beautiful colonial architecture. Trek to hidden waterfalls or make friends with local fisherman for an abundant supply of freshly caught seafood. For some brides the thought of walking down a church aisle to the tune of “Here Comes the Bride” is enough to incite an outbreak of hives. Particularly when one can replace the church aisle with a lush rainforest walk and the songs of native birds. Only to emerge to emerge to greet your future husband who is waiting beside a crystal clear natural pool with cascading waterfall backdrop. For nature lovers, there are several majestic waterfalls dotted throughout the Fijian archipelago that offer easy access for the bride, groom and wedding guests. We can even organise for a tribe of Fijian warriors, or the ‘Bili Bili’, to carry the bride on a traditional wedding throne. This is one way to make an entrance!